We chat to SA artist Capso about his collaboration with Grammy Award-winning singer Wyclef Jean. 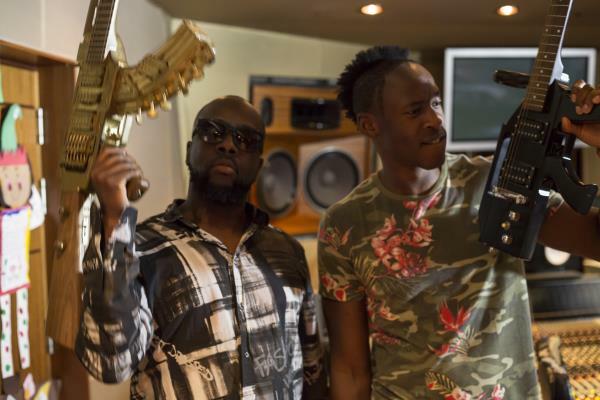 Democratic Republic of Congo-born and South African-raised artist Capso collaborated with Grammy Award-winning singer Wyclef Jean. We had a quick chat about working with him on the song Firestars, which was recorded at the legendary Daddy’s House studio in Manhattan. How and where did you meet Wyclef Jean? First time I met him it was back in the 1990s while I was listening to The Fugees’ The Score and he used to live in my headphones. That’s when we used to have the CD players and I think I had them on the tape too. But for real though, it was at a meeting in a studio in New York. Tell us about recording in New York? It was like being in my music video for Dreams. I felt as though I might wake up at any time coz it was just unbelievable. The city itself with all of the lights, the architecture, the history and most notably the people, was really energising. You just got a feeling, a vibe. What was it like working with someone like him? I mean, he’s worked with Whitney Houston, Michael Jackson, Santana, Beyonce, Shakira, T.I., Lil’ Wayne, Akon and I could go on. You would imagine that it was intimidating, but Wyclef really made me feel right at home. I got a lot of confidence from his reaction to my music video and song Dreams, which I showed him on YouTube. After seeing this, he decided we should start working on a brand-new song together. Are there plans to maybe do more work together? Yeah, we family now. Are you busy with a new album at the moment? I’m just doing singles right now. So every day I’m just working on my dreams so I can see them happen tomorrow. Well, I like to focus on the present moment because it’s the only thing that you can ever be sure that you truly have. ‘Today is yesterday’s dream of tomorrow’ – that’s my new tattoo I’m about to get. For the year ahead I see good health, happiness, wealth and success. Who are the artists you’d best like to collaborate with? Local and international? Locally, Mafikizolo and Zahara. Internationally, Asa and Earl Sweatshirt. Tell us a bit of your travels? What have some of your best destinations been? Zanzibar was dope. I like the UK because of the accents. South Africa is my home and within it I am forever road tripping – from Mpumalanga God’s Window to a part just before you hit Namibia and you feel like you’re in the desert but you’re not. The Eastern Cape is still one of my favourite spots. Would you ever consider living and working abroad? I did live abroad. The grass always seems greener on the other side and on the other side, it is the same. What do you love most about living and working as an artist in SA? The architecture. The space. There’s a lot of space here. Paris is where a lot of the big artists did some of their best work but I think their work would be so much better if they did it here – it’s just buildings after buildings there. I like living and working as an artist in South Africa. I like the fact that it makes me work harder every day. Hoping to be better. Knowing that there is better. After all, there’s a thin line between Alexandra Township and Sandton.